"Game Box in Repose on Oak Dining Room Table"
This is how I draw stuff. The finished game board a la photoshop. Goofy robots make me happy. Sketches of some of my favorite old acquaintances from school. ...And the finished game, in morning sunlight, upon shooing the cat away 14 times. Boardgame design has always gone down as one of my all-time favorites for illustration projects. In fact, just about any toy or game related assignment is pretty much guaranteed to rev up that kid in me. I love the process of designing and illustrating the different components that go into a working game and then to one day get to finally see the final product sitting on my doorstep. 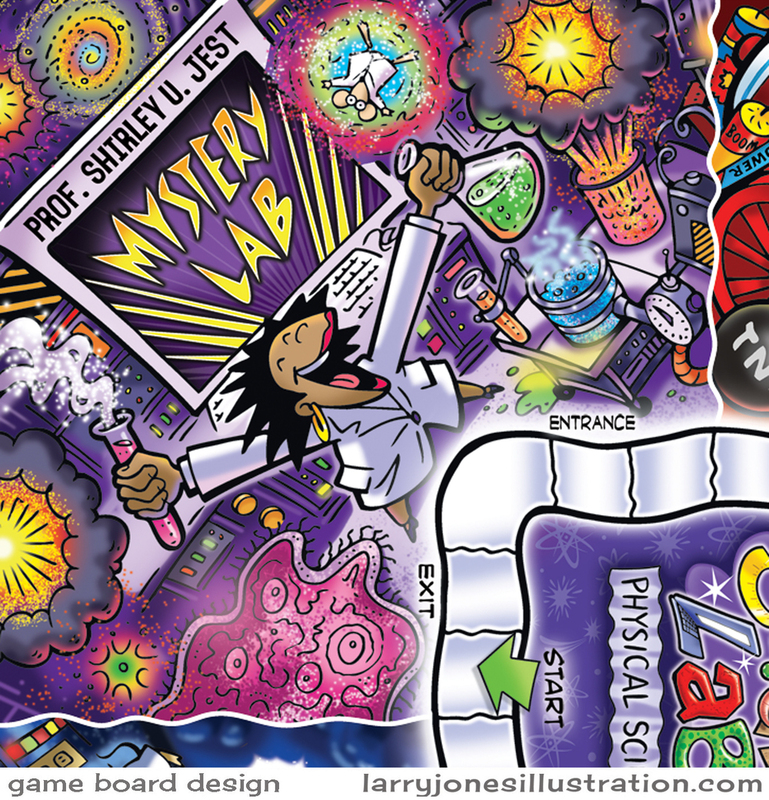 Here's a collection of art for three separate science-themed games I worked on a while back for the educational market. Everything began with very rough pencil sketches and color mock-ups. The final art was hand-inked, scanned in, and colored in photoshop. Creating Christmas card art in July is not all that unusual around here. In fact, stop by some time during the summer and you might just hear some classic Bing Crosby completing the mood in the studio. Happily, this time, the art had me dreaming of snorkeling some far-off tropical waters. 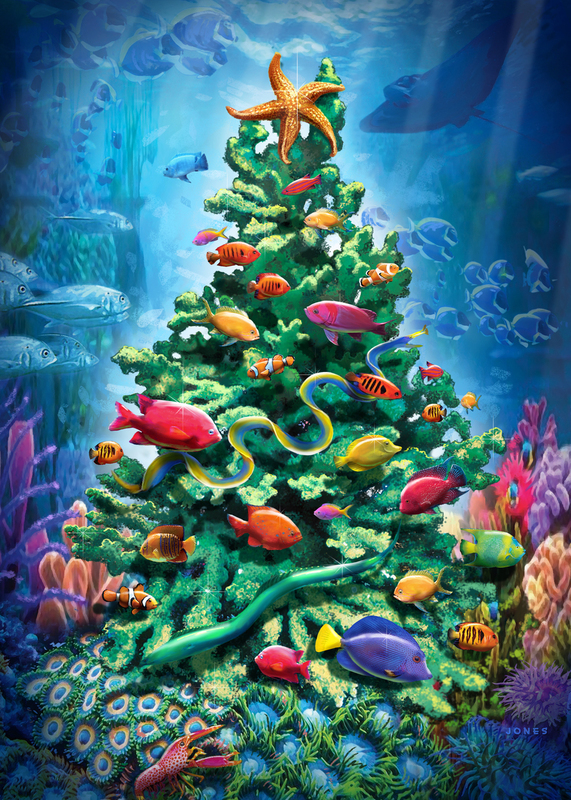 And yes- there's actually a market for beach-themed Christmas art. 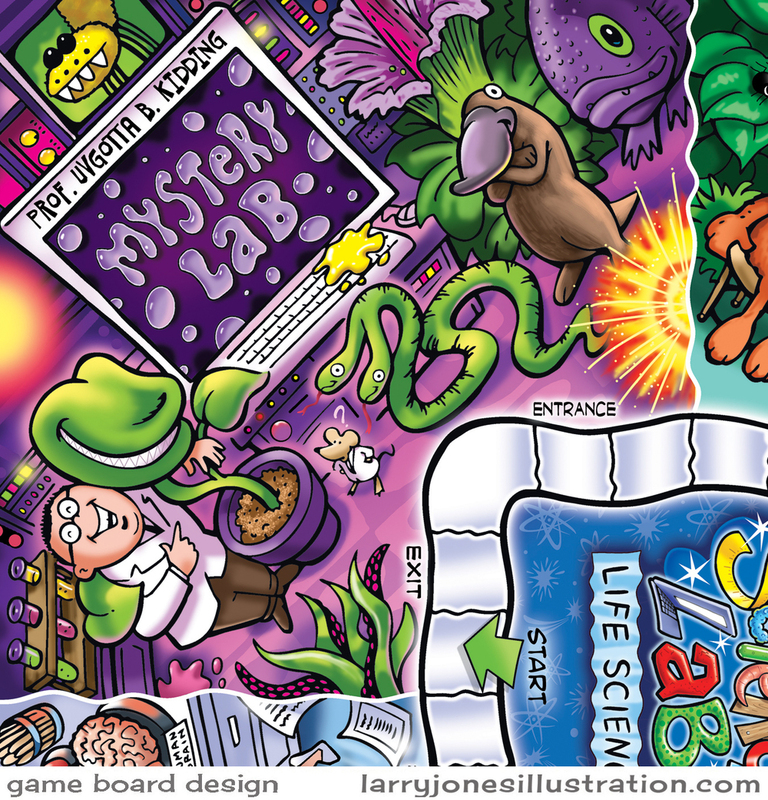 Over the past few months a slew of illustrations have been pumped out for the Junior Ranger Activity Book! This is a book of games, mazes, puzzles etc that The Maryland-National Capital Park and Planning Commission is handing out as a freebie for young visitors to their parks. As a child I used to love combing through Hi-lights magazine to do the picture searches, etc. Kind of funny that I'm drawing them now. Storyboard Frames for Network Health/ GKV. Here are eight recent spot illustrations done for a children's magazine that won't be published for a few months... (so I can't say which one right now.) The theme of the article is about the origins of common games we all know and play. Adobe illustrator is becoming more and more my program of choice these days. I don't know if it's because it produces such clean art, or the fact that it has unlimited "undos". All I know is that it takes the sloppy artist in me and cleans him right up... like having my own personal illustration robot to do my bidding. The game of chess originated in India where the bishop was actually a camel or elephant. 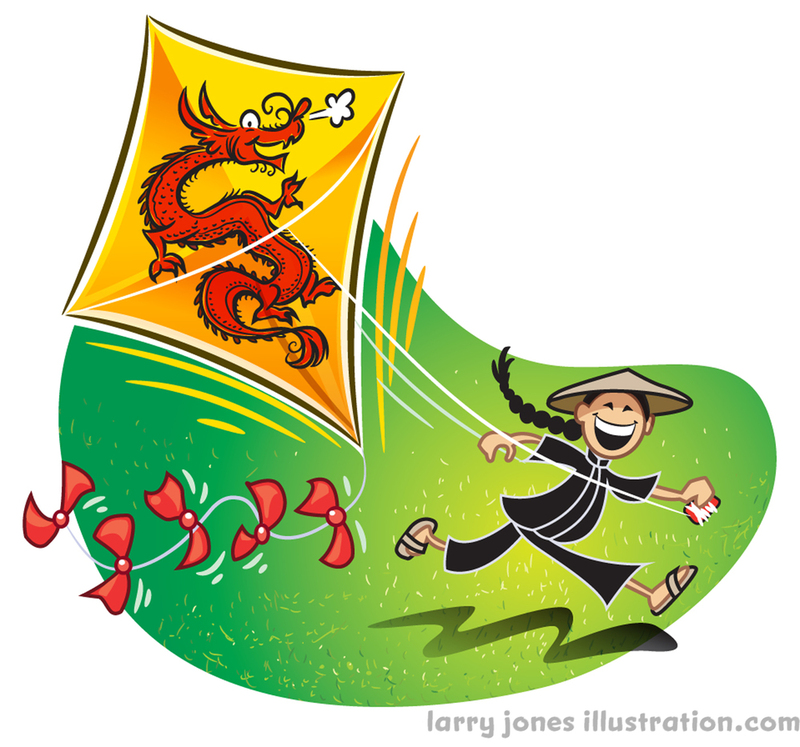 Kite flying got it's start in China. Checkers has 3000 year old roots in Iraq. The game of marbles originated in Egypt. The game of Jacks used to be called "knucklebones" and originated in Greece... and used real bones! We have the Dutch to thank for our jump-ropes. An ancient Greek vase was found with art depicting someone playing with a yo-yo. A 3500 year old clay top was found in Iraq. 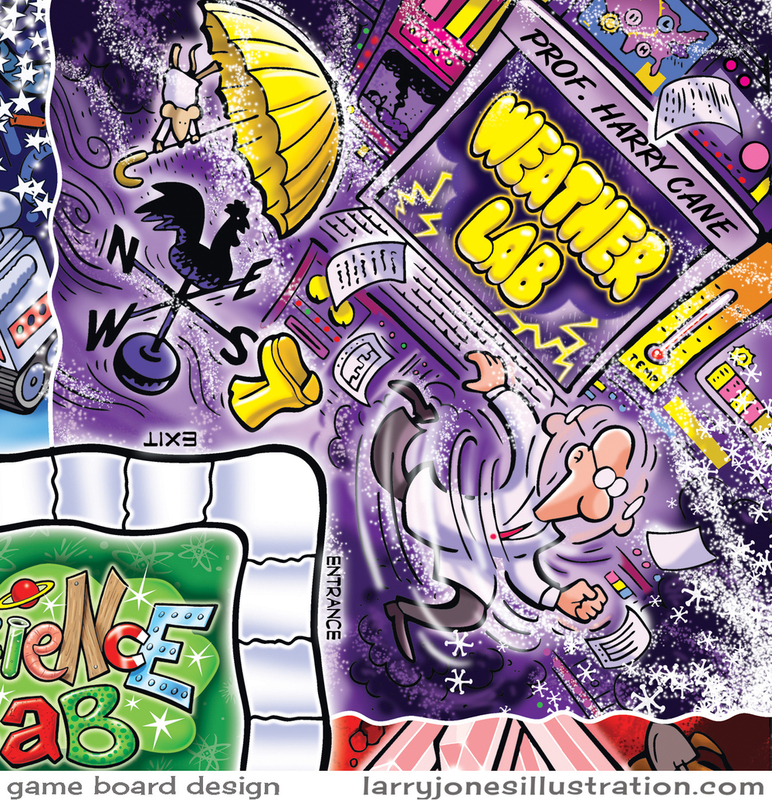 Thanks to my friends at Demco over the years, my portfolio now has a pretty extensive collection of reading-themed art. This particular series was created for their 2015 library theme... and this time more geared to adults as opposed to my usual kid stuff. With the "exercise" theme established, and a request to have the art look a bit old-school and retro in nature, most of my creative decisions were already made. The aged effects are thanks to photoshop. All line work created in Adobe illustrator on a Wacom Cintiq monitor. "Holy diamond ring Batman!" 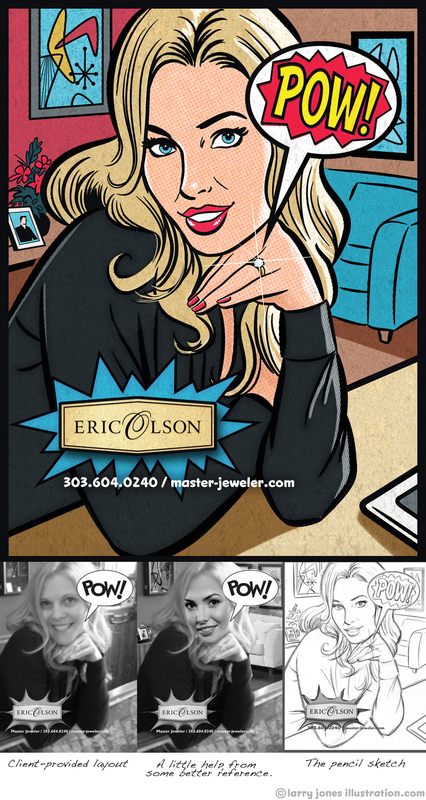 Recently a client asked if I could create an ad for Eric Olson Jewelers in a mock-comic book style. After receiving the client's layout, I clicked about for a short while to find a good face for reference and took that mock-up straight to a finished pencil sketch. The black line was digitally inked in Adobe Illustrator and then imported into Photoshop where color and a series of effects were applied. To get that retro printed feel, I scanned-in a textured paper background, and added some layers of speckles and noise. Also thanks to Mr. Retro's Permanent Press filter, I created a layer of ben day dots to finish the comic book effect.